Everyone recognizes these girls! 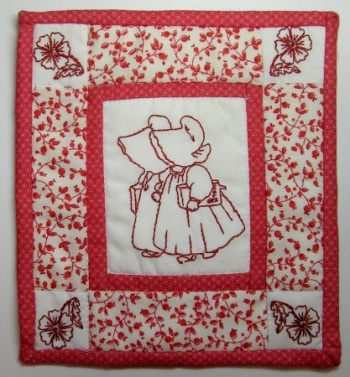 They are the sunbonnet gals, better known as sunbonnet sue and friends. They are icons in the quilt world and treasured favorites among quilters. This months project introduces several new things. First, we are using redwork embroidery. This is also a very authentic, well loved technique in quilting. In addition, we will be adding a narrow border to a center motif, and then another border with inset embroidered corners. And finally, we will be using a separate binding method on this project. So lots of new techniques to learn! This project can be done by machine or by hand. Finished quilt measures 6" x 5 1/2". This kit will ship on July 15th Online class is scheduled for August 14th. August, September and October kits can be ordered and shipped together to save postage costs.